From experience, during an office furniture makeover, chairs tend to be last on the list and considered the least important, however after reading this, that may change. If your job requires you to be sat down at their desk for 8 hours or more a day, having your chair set up correctly is crucial. 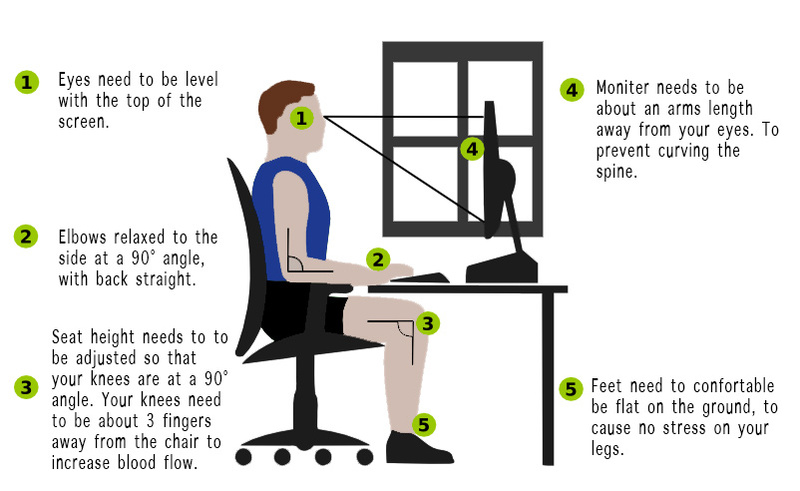 As staying in the sitting position for long periods of time will put stress on the back. Your workstation becomes an area that is quite personal to you, so making sure your space allows you to work comfortably, helps keep your mind and body healthy and productive. It’s worth taking the time to consider what chairs you would like to purchase, as everybody is made in all different shapes and sizes, so no one chair will suit everyone. What makes a good working chair? It’s important that you don’t buy a chair because it’s cheap and “does the job” as it will cause pain in the long run. Looking after the workforce and will only have benefits for the business. What functions should you look for in a quality ergonomic chair? This function allows you to easily change the height of the chair, to allow you to sit with your arms comfortably at a 90 degrees angle to the desk. This keeps your wrists to stay in a neutral position. If you find that any chair you find doesn’t physically go any lower and your feet don’t touch the floor, footrests are a good way to help keep your feet flat and your legs straight, removing any potential stress on the back and the knees. To check if your seat is set up to the correct width, use two to four fingers and position them behind the back of your knees, if you find you can’t do that, it means that the seat width is too big, which will reduce the blood supply to your legs and feet. When you have found a chair with the correct width, you will need to think about the depth. When sat, the seat needs to be at a slight forward tilt, meaning your hips are sitting higher than your knees, again this helps improve the blood flow to your legs and feet. When placing your back against the backrest, do you feel that it shapes to the curve of your spine and supports it well? The design of the backrest needs to have a slight curve at the bottom as this is where your spine naturally curves. The Harvey chair from OCEE includes the option of having an inflatable lumbar cushion on the chair, which means you can change how much support you want and what is comfortable for you. The benefit of this function will keep your spine in its correct position, to stop you from slouching. This function allows you to freely move from an upright position or to a reclined position. If you are someone who likes to move frequently, this option helps to keep the spine supported. When changing from positions, always make sure that the angle between your thighs and lower back are between 95 – 120 degrees, to allow blood and oxygen to flow. This option isn’t for everyone, some people may prefer to stay in the upright position and after 30 mins, get up and walk around to take stress off the back. Many ergonomic chairs like the Absolute chair from OCEE have a body balance mechanism that enables the chair to move however you do, this is a great function to have as it increases blood flow and oxygen to the muscles. The amount of movement will adjust to your body weight, so whichever way you decide to sit this mechanism will provide you with the correct amount of support, without you have to apply extra force to get comfortable. When you’re sitting down at your desks, the armrests need to be at a height that allows your shoulders to relax and your arms kept at 90 degrees, don’t allow your arms to stretch across the desk, as this pulls you forward, with no support to the arms and back. The armrests should be at the same height as the desk, so bring the keyboard and mouse forward to whatever distance you feel works best. Purchasing a new office chair is an important decision and there are many factors that need to be considered, a chair is something you will be using on a daily basis for long periods of time, so getting the correct functions and mechanisms right is really important. A poor quality chair will affect your productivity and cause problems later down the line. At Office Changes, we give you the opportunity to try out a chair of your choice for a couple of weeks to see if it is the right fit for you and your workforce. It is worth noting that a new chair will take a few days to get used to before you start to feel the benefits from it. If you would like to speak to an ergonomic expert, please call us now on 01444 474728 or email info@officechanges.com and we will be more than happy to help. https://www.officechanges.com/wp-content/uploads/2019/04/harvey-with-isaac-sitstand-workstation.jpg 1500 1000 Chloe Standen https://www.officechanges.com/wp-content/uploads/2017/10/O.C-Logo-1030x124.jpg Chloe Standen2019-04-12 12:34:282019-04-12 13:28:45ARE YOU SITTING COMFORTABLY?